Home » Blog » News » Book Spring Lawn Care Early! In the heart of the winter, spring lawn care is probably the last thing on your mind. After all, you’ve got snow to shovel and afternoons in the backyard seem so far away. But, believe it or not, the time to book spring lawn care is now! 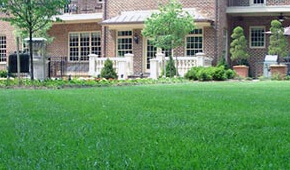 Why Should You Schedule Spring Lawn Care Early? It may seem like there are more pressing matters than scheduling lawn care in January or February. So why should you schedule now? Come March, everybody will be scrambling to schedule spring lawn care—so if you want to guarantee service, you’ll need to book sooner rather than later. Landscaping companies tend to be less busy in the winter so they’ll be able to give you extra attention through the planning process—which is especially important if you’re planning something a little more extensive than basic lawn mowing, like a lawn renovation or flower transplanting. This is also a good time to start planning hardscape projects and landscape designs you want completed come springtime! If you want to give yourself enough time to fully consider all the options, the time to schedule is now. This way, you can thoroughly think about all the different services we provide and which ones are most relevant for you, both in terms of pricing and the scope of your landscape. Having spring lawn care booked now will give you peace of mind. You won’t have to worry about competing with others for the most convenient timeslots or the best landscape companies in the area! At O’Grady’s Landscape, our spring law care services fill up quickly. After all, landscape and lawn maintenance is critical to the health and growth of your plantings and grasses and is necessary if you want to keep your property looking beautiful. So the earlier you call for scheduling, the better! For the most convenient scheduling and guaranteed service, call O’Grady’s Landscape today for all your spring lawn care needs! We serve homeowners in the City of Falls Church, North Arlington, McLean, Great Falls, and Vienna and can be reached at 703-533-5001.